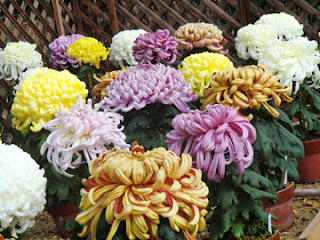 Today I went to the Kyoto Botanical Garden,to see a chrysanthemums show. This Botanical Garden is located in Sakyouku,Shimogamo,Kyoto. The chrysanthemums are at their best now,at the beginning of November. This mixed-color chrysanthemums are beautiful. Next,let's go to the garden outside. 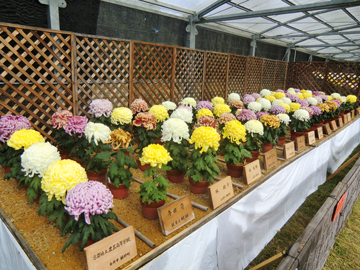 This is the garden.Many chrysanthemums for contest are exhibited here. There are many ways of planting in chrysanthemum. 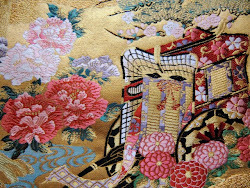 Please look at this picture,this is called "Kengai-zukuri". This imitates tufted wild chrysanthemums drooping between rocks. 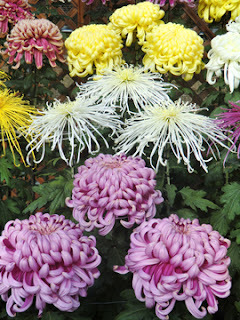 This is also one of the way of planting of chrysanthemums. 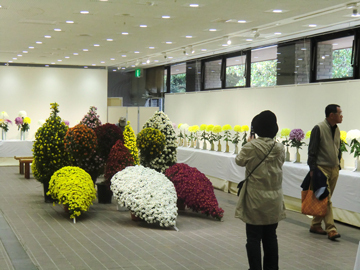 So many chrysanthemums for competitions are lined up side by side. 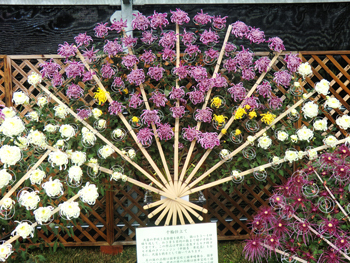 Some of the chrysanthemums were awarded a "gold prize" or "silver prize" by the sponsor. the size and the shape of the flowers,etc.. This layout is called "Sanbon-Shitate". Three chrysanthemums are planted in one place side biy side. 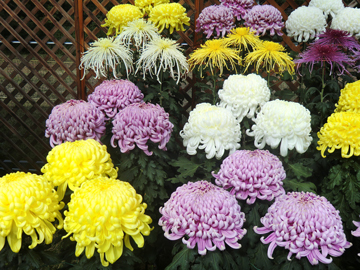 The nearest three yellow chrysanthemums are called "Hosokuda-Saki". These are like fireworks,really beautiful. These are "Golden Prize" chrysanthemums. Every element meets adequate standard of quality.They're wonderful. Thank you for these beautiful pictures, Kumiko-san. I didn't know that you even have names for different flower arrangements. in Belgium and a few other European countries it's customary to decorate the graves of your family with chrysanthemums on All Souls Day (2nd November), which is not usual in the rest of the world. Therefore few people plant them in the garden, which is a pity because they are nice flowers. All Souls Day,that's new to me.Yes,it is not usual to us. 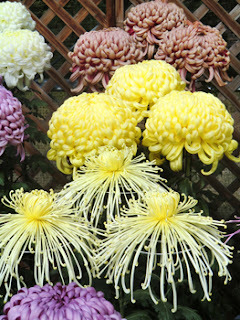 But it is interesting, maybe chrysanthemums are funeral flowers throughout the world.We Japanese also decorate chrysanthemums at our funeral scene. But some of the people grow chrysanthemums to enter them in a flower show.Especially elderly people love to grow chrysanthemums in Japan. Hope you'll have a wonderful day,Walter! 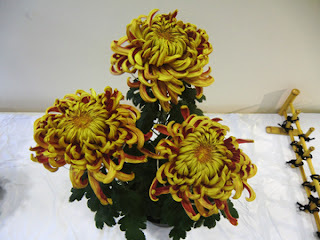 I love, love, love all of these beautiful Chrysanthemum's. They are so beautiful! I especially love the fan shaped planting! Yes,it is really unique and Japanesque. Hope you'll have a wonderful Christmas Holidays. What happened here? I only removed the first comment, as there were some mistakes there! I love the photos, Kumiko! Chrisanthemum is one of my favourite flowers. I love them in any shape, size and color! 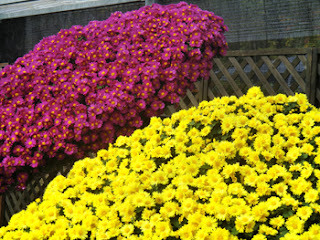 I'm happy if you like these chrisanthemums. In Japan,chrisanthemumus are loved by many people.And eldery people like to grow chrisanthemums in their garden.It is their hobby after retirement. I'm happy if you enjoy these photos,Traveling Hawk! 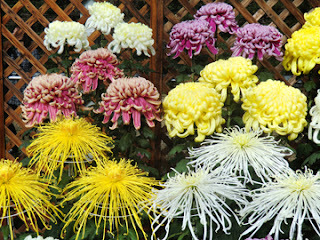 Yes,me too.I love every type of chrysanthemums. It is difficult to choose,but if I pressed I would say deep reddish violet one is the best.